With a 3-2 victory, Pittsburgh is two games away from winning their Eastern Conference semifinal. PITTSBURGH — Patric Hornqvist and Tom Kuhnhackl scored a minute apart in the first period, Matt Murray stopped 47 shots and the Pittsburgh Penguins took control of their Eastern Conference semifinal with a 3-2 win in Game 3 on Monday. Carl Hagelin added his third goal of the playoffs for Pittsburgh, which took a 2-1 lead in the best-of-seven series on another contentious night guaranteed to keep the NHL player safety office busy. Two days after Washington’s Brooks Orpik earned a three-game suspension for an illegal hit on Pittsburgh’s Olli Maatta, Penguins defenseman Kris Letang took a shot at Capitals forward Marcus Johansson sure to be reviewed before Wednesday’s Game 4. Alexander Ovechkin and Justin Williams scored in the third, but the Capitals find themselves in a deficit against a franchise they have beaten just once in eight previous playoff meetings. The Penguins were hardly crisp but turned Washington mistakes into goals while Murray did the rest. The 21-year-old rookie outplayed Vezina Trophy finalist Braden Holtby to move Pittsburgh within two wins of a spot in the conference finals. 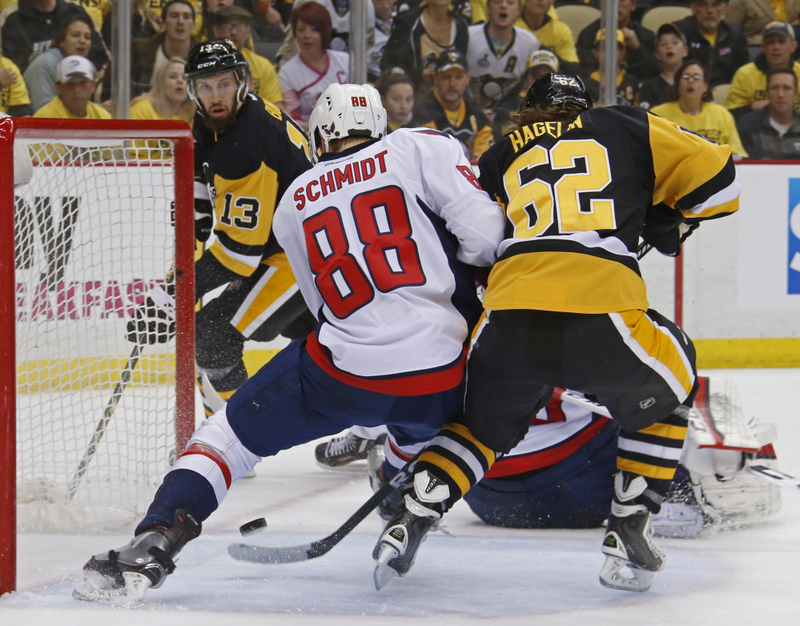 Playing with urgency, the Capitals outshot Pittsburgh 49-23 and outhit the Penguins 58-25. But it hardly mattered. The NHL’s best team during the regular season has just one goal in the last six periods against Murray, who is playing so well Marc-Andre Fleury – who dressed for the first time since suffering a concussion on March 31 – might want to get used to the view on the bench. Wearing the same Pittsburgh gold uniforms that team owner Mario Lemieux wore during the club’s consecutive Stanley Cup runs in 1991 and 1992 – runs that included victories over Washington – it seemed like old times for the Penguins. The defense in front of Murray was steady even with Derrick Pouliot making his playoff debut while replacing Maatta. CAPITALS: Orpik says he has no problem with the three-game suspension the NHL levied on him for making contact with Maatta’s head in Game 2 on Saturday night. Orpik called the decision “fair” while speaking to reporters following Washington’s morning skate on Monday ahead of Game 3. CALDER FINALISTS: Edmonton forward Connor McDavid, Philadelphia defenseman Shayne Gostisbehere and Chicago forward Artemi Panarin are the finalists for the Calder Trophy for the NHL’s top rookie of the year. The 19-year-old McDavid had 16 goals and 32 assists despite missing much of the season due to a broken collarbone, living up to his hype as the No. 1 overall pick in last year’s draft. Gostisbehere led rookie defensemen with 17 goals and 29 assists in 64 games. The third-round pick from the 2012 draft scored four overtime goals, matching a single-season record for a defenseman. Panarin, 24, led all rookies with 30 goals and 47 assists in 80 games. RANGERS: The Rangers agreed to a deal with backup goalie Antti Raanta.